These words are being written as great pain wracks the hearts of Jews around the globe. 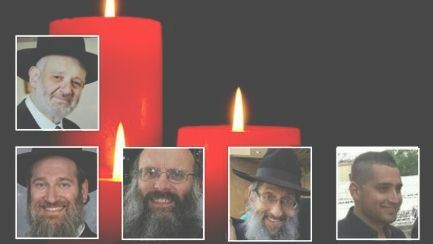 Four Rabbis, wrapped in tallis and tefillin, deep in prayer to the Almighty, were slaughtered in their synagogue in the midst of the Har Nof section of Jerusalem, their lives violently taken by Palestinian terrorists who attacked them with axes, meat cleavers and guns. The shock and horror fill our thoughts and we are left reeling, asking ourselves what can we do? So many of us live an ocean away, how can we help the widows and orphans, the injured and their families, and all of Israel in the face of this tragedy that is beyond comprehension? There is a way. The Lubavitcher Rebbe, Rabbi Menachem M. Schneerson, of righteous memory, taught us that there is something we can do to help. The Rebbe taught us the great power of a mitzvah. A mitzvah reaches deep into the core of our being – inside where we are all one -- where the physical distance between us is of no consequence. At this core, a positive deed on our part will help bring salvation. We visited the families of the four Rabbis, whose lives have been shattered with grief. We talked with members of the extended families about beginning a Mitzvah Campaign in their memory. They told us to please go ahead and do so. When tragedy has struck in the past, the Rebbe made practical suggestions of mitzvahs that would elicit G-d’s blessings and protection. Let us not underestimate the real power of good in our world! Please take a moment to do one or more of the following mitzvahs and then add your pledge to our mitzvah counter. We will let the families know the number of mitzvahs done in the memory of their loved ones. Each mitzvah we do begets another mitzvah. We want you to know that we are arranging for financial assistance for the families of the four Rabbis and also for the families of the injured who are fighting for their lives in the hospitals. We are also providing all the emotional and practical help we can, including for the wife of one of the injured Rabbis. The father of a large family with 10 children, was stabbed repeatedly in the head, the back and the arm during the rampage. Thank G‑d, the attack missed his brain, spine and all his vital organs. He is in the hospital and will be there for a while. His wife is with him and needs to stay at the Hadassah Malonit (hotel adjacent to Hadassah Hospital) and CTVP will cover the costs for her. Babysitters are being organized for the children. Whatever CTVP can possibly do for these families, we will do, and we will do so for as long as they need us by their sides, no matter how long that is. Please participate in this important Mitzvah Campaign on their behalf by clicking here. Thank you.